This work examines relationships between religious communities and laity in Warwickshire in the period 1500-1540. 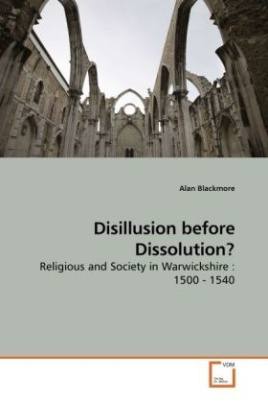 It is hoped to show whether the laity of Warwickshire were disillusioned with monastic religion, or whether monasticism was an essential part of religious life. This aspect of religious to lay relationships has been little researched to date. A number of themes are discussed. The first is a brief description of the research already undertaken and published. Other themes are, the economic and spiritual condition of the religious houses, surviving wills to understand the relationships from a testamentary aspect, litigation evidence to gauge the levels of friction, the effects of the Dissolution on the religious and the potential impact on the areas in which the houses were located. Evidence shows that relations between religious and laity were by no means poor. There were some localised issues but nothing that would have caused a breakdown in relations. In order to satisfy religious needs, the laity had a choice between the local parish church and the nearest monastic house. Their choice quite simply, fell to the parish church. Bitte schreiben Sie uns Ihre Meinung zu: Disillusion before Dissolution?